Vita Liberata Trystal Self-tanning Bronzing Minerals ($55 with a brush): A staple despite the fact that it’s a self-tanner FAIL. (Read my full review and see Renee’s review here.) I think this $25 set with a mini pot, the kabuki brush, and a mousse is brilliant actually: it contains 1/3rd of the full size–which is fine because the bronzer is so pigmented that only a few crumbles are needed for your whole face–and the synthetic-hair brush buffs the minerals in for a super smooth and natural finish. Note: Sephora only sells the darker shade (No. 2 Bronze), which is the one that Renee reviewed. Laura Mercier Mineral Powder SPF 15 ($40): One of my Fabulous Furrrrrvorites (see the link in the menu bar). I’ve used and repurchased this mineral foundation for a million years and it bests any cushion compact in my stash–yes, even better than the AmorePacific cushion that I love (and recommended in Part 1). It gives smooth, natural, and luminous medium coverage that lasts all day and wears off without obvious patchiness–something I can’t say about cushions. It’s what I wear if I have to look good for drinks after work. Real Sand matches when I’m NC20 but looks too dark when I’m NC15. Unfortunately, the next lightest shade, Soft Porcelain, is too pale (~NC10), so I can wear this foundation only a few months out of the year. And if you’re wondering, I was a loyal bareMinerals user before I upgraded to Laura Mercier. IT Cosmetics Bye Bye Pores Poreless Finish Airbrush Powder ($24): Not just another silica powder. Silica’s the top ingredient, but something about the combination with other ingredients and how finely milled it is makes this stand out from the other HD powders I’ve tried (MUFE, Tarte, NYX). It mattifies and blurs just like the others, but it also feels and looks soft and doesn’t add whiteness. I ignore the puff that comes with it and instead apply with a fluffy brush. Tatcha Balanced Pore Perfecting Water Gel ($68): We received this from Tatcha during the summer but never reviewed it. It’s weird that I (the one with the dry skin) am the one recommending it. I’ve learned to stay away from gels and gel-creams because they’re disappointing when it comes to actually moisturizing (ahem Nature Republic AQUA Super Aqua Max Watery Cream). My skin’s pretty balanced in the summer though, so I gave this Tatcha water gel a try and was really impressed that it actually moisturized instead of evaporating like water or superficially smoothing like silicone. It’s not enough now that the weather’s cooler, but it’s fab for summer or for oilier skin. Josie Maran Whipped Mud Mask Collection ($48): I admit that 90% of this recommendation is because of the rainbow colors. OK, maybe 100%. The faintly scented masks leave skin feeling soft, clean, and smooth without dehydrating or being a pain to wash off (but do swipe toner on afterward; I’ve found orange/green/blue residue even when my face looks clean). However, the effects aren’t dramatic or unique. It’s the colors that makes this worthwhile. They’re just so darn happy and amusing to slap on. I’m a grown adult and fully enjoy looking like Slimer once in a while. It’s that JOY factor! Update: The masks dried out within a few months. I only recommend this set if you’re going to break it up into mini gifts or if you do mud masks a LOT. 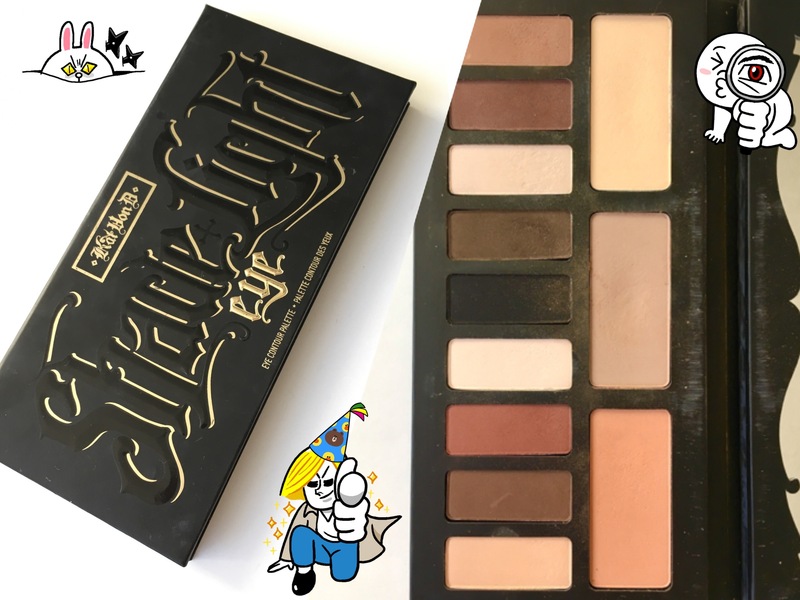 Update: Can’t believe I forgot the Kat Von D Shade+Light Eye Contour Palette ($46). Almost-perfect rating and 1,622 reviews on Sephora for good reason. As someone with puffy hooded eyes, I really appreciate these strongly pigmented mattes–especially the midtone and dark shades–to shape and define my eyes more dramatically than my usual shimmery taupes can. For a more smoky/dramatic look, I’ll follow Stephanie Lange’s “dome” method for hooded eyes–which actually works for my Asian eyes unlike 90% of hooded eye tutorials. She has good tips throughout, but you can skip to 4:00, when she begins to walk through the actual steps. She has videos demo’ing natural and glam versions of the “dome” shape, too. The mid-tone shades also make for great transition colors for my shimmery taupes. What do you recommend *I* check out at Sephora? “It looks better as the day goes on” is so right. Sometimes I wear it after a couple of weeks of just wearing cushions and I question why I ever strayed.